Abstract: Post transcriptional modifications of proteins and nucleic acids are well-recognized as playing a major role in many cellular processes. Recent biochemical and biological data suggest that the enzymes involved in such modifications, including phosphorylation, acetylation, methylation, etc, play pathogenic roles in cancer, inflammation, and neurodegenerative diseases. Thus, pharmacological modulation of these enzymes by small molecules will be beneficial in developing novel therapeutics for multiple unmet medical needs. Of these, methyltransferases are known to alter the epigenome by altering the methylation status of nucleic acids or proteins resulting in changes in cellular functions. In order to screen for modulators of these enzymes for the development of next generation of drugs, robust screening assays are urgently needed. We have developed a novel assay that monitors the activities of methyltransferases and their modulation by small molecules. The assay is universal since it is based on quantitation of S-adenosylhomocysteine(SAH), a product of most methylation reactions, thus can be used with of a broad range of methyltransferases such as DNA, protein, RNA, and small molecules methyltransferases. 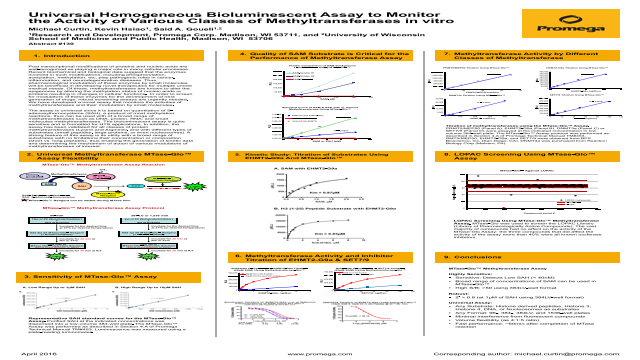 The bioluminescent assay is quite sensitive and is formatted for HTS applications. In addition, the assay has been validated for all classes of protein methyltransferases (Lysine and Arginine), and with different types of substrates (small peptides, large proteins, or even nucleosomes). A strong feature of this assay is its utility with a broad range of substrates with no limitations their concentration or composition (short vs. long peptides), thus enabling the generation of kinetic data and determining the mechanism of action of various modulators of methyltransferases of interest.